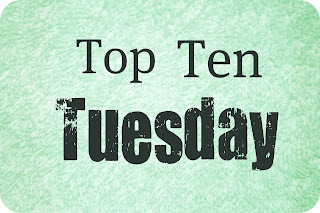 Top Ten Books Freebie! Your time to pick whatever topic you’d like! The vampire/zombie apocalypse books are a new genre for me, i.e. I haven’t read a lot of these yet, but those I did have really hooked me in! The Walking Dead TV series is one of my fave things right now. I’m including some books that are in my WishList too! I Am Legend by Richard Matheson : This is a classic in the genre and remains one of my all time faves. The Passage: A Novel by Justin Cronin: I read it since it was hyped as this amazing new literary horror novel, and wow, did it live up to it! The cliff-hanger ending had me dying for the sequel. World War Z: An Oral History of the Zombie War by Max Brooks: I first borrowed this from the library, but it was so good that I had to buy my own copy. Super realistic accounts of a zombie apocalypse! Salem’s Lot by Stephen King: Okay, this isn’t really apocalyptic since it only concentrates on Jerusalem’s Lot (a small town in Maine), but it’s easy to imagine the vampire takeover spreading worldwide! The Walking Dead by Tony Moore, Robert Kirkman, Charles Adlard and Cliff Rathburn: I started reading the comics because of the TV series. Super violent but oddly compelling. Cell by Stephen King: A very frenzied, gory, blood-spattered horror novel from the master. Patient Zero: A Joe Ledger Novel by Jonathan Maberry: I haven’t read this, but my brother swears this military thriller is fantastic, and has lent me his copy. Dark Inside by Jeyn Roberts: I’m cheating a bit, since this one doesn’t have zombies/vampires, but the outbreak here causes ordinary people to turn into homicidal maniacs, so it still counts, right? I really liked the teenage survivors in the book. Plague of the Dead (Morningstar) by Z.A. Recht: I haven’t had the chance to read this yet, but the series was highly recommended to me, and I do have a copy given to me on my Birthday. Day by Day Armageddon by J. L. Bourne: I haven’t read this yet either, but the reviews are great and I love that this is supposed to be a “handwritten journal depicting one man’s struggle for survival”. On my wishlist for sure! The Passage sequel is also out now! I’m reading it, and it’s just as good as the first one. I haven’t read a lot of zombie books but these look cool. I loved Warm Bodies, which isn’t on your list, but I recommend it if you haven’t checked it out yet. I’ll check out that book you recommend. Thanks! Yeah, the volumes are super violent but like I said, very compelling and addicting.